Although initially scheduled for release midway through 2010, its taken some time for long running Tampa (Florida, U.S.) based death metal act Deicide to get around to unveiling their follow up to 2008’s Till Death Do Us Part. But after lengthy delays and setbacks, Deicide have finally returned with To Hell With God, which is their tenth full-length studio release, and their first for Century Media Records after splitting with their former label Earache Records in early 2010. Working once again with the same line-up that has produced the band’s last couple of releases (including vocalist/bassist Glen Benton, lead/rhythm guitarists Jack Owen and Ralph Santolla (who’s also a current member of Obituary) and drummer/additional guitarist Steve Asheim), To Hell With God is exactly the sort of album you would come to expect of Deicide. But that’s not to say that To Hell With God is a carbon copy of what Deicide has already achieved on their former releases The Stench of Redemption (2006) and Till Death Do Us Part. On the opening title track To Hell With God, Deicide have obviously made some attempts to step up the technical aspect of their performance, which demonstrates their ability to deviate from the familiar bludgeoning death metal sound of their past, without compromising one bit, on their brutal sound. Benton’s vocals also seem to sound a little more inspired than some of their more recent efforts, with the demonic guttural growl boasting a little more venom than usual (all the while remaining articulate on the lyric front). But what really stands out is the production. Mark Lewis (who has previously worked with The Black Dahlia Murder and Chimaira) has really given the band a crisp and clear sound, which more than compliments the entire group, without losing any of the crushing impact of the band as a whole. It’s a whole new sound for Deicide, but one that definitely works in their favour. Save Your is another stand out favourite with its speedy delivery, Asheim’s thundering drum interjections throughout the song and the classy touch of the melodic guitar leads, while the sheer blitz of Witness of Death, Servant of the Enemy and Hang in Agony Until You’re Dead are masterfully balanced against tracks such as Conviction, the slightly progressive influenced Empowered By Blasphemy, the slower paced Into The Darkness You Go and the superb closing anthem How Can You Call Yourself a God. 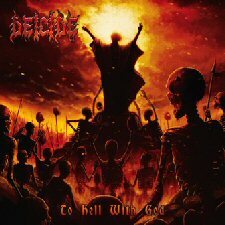 To Hell With God isn’t a monumental change from what you would normally expect of Deicide (especially in terms of the overall theme of Benton’s lyrics), but it does have enough surprises to keep things interesting for long time fans. And besides that, what really makes this album stand out is that given Deicide’s track record over the last twenty years, it’s evident that To Hell With God is by far one of the band’s strongest efforts in a long time. And that’s worthy enough of some well earned praise.